This week, I finished off the Raven Guard I was working on (obviously after Monday's post) and shipped them off to my friend. A few things I ordered in the mail finally came in and I went ahead and ordered some more stuff too. As a side note, the model you see there in the middle sporting the all white scheme... he has since been completely stripped and will be reworked. Great idea, poor execution. Just wondering what you use the old toothbrush for? And is that Liquid Blu-Stuff I see trying to hide in the top left corner? If so you are a lucky man to have some already,can't wait to get my hands on some. 1. Cleaning models of mold line debris. 2. Stripping models of paint. 3. Scrubbing resin models of their release agent. And yes, that is Liquid Blu-Stuff. I had to sell my soul to get some and I'm dying to try it out.I just need to pick the right piece to experiment with. If it's anything like it's sturdy little brother, it will open up even more options for my modeling. Nice to see a shat of the master at work! Was just wondering, what's your take on the new GW paint range? I know you're not tied to a particular brand and chose what you like. I didn't want to have to spend loads of money so I was firmly of the mind that they would have to be amazing to make me think about buying some but after using a couple in store yesterday, I have to say I'm impressed. 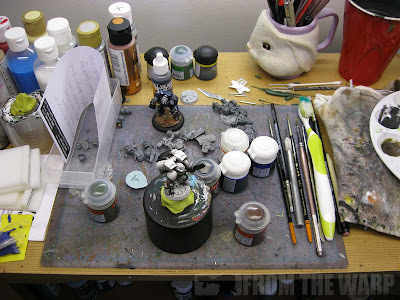 Particularly witht the dry, textured, glazes and washes. Sorry for the typing error in the previous post! ieuan: I have not had the chance to use them yet... I suspect I'll pick up the new colors as I need them, but I don't have any plans to go out and buy/try/convert over to them right away. I'm more than happy with my current setup so I suspect I'll slowly include the new paints into my collection over time as the need arises and not because of any other reason. Thanks, but I don't know if I'd say my stuff pops... there are other folks out there doing it far better than I am. My style is leaning more towards the grim and dark each day. Honestly, if a painter has a clean desk, they are doing it wrong! Looks like some solid work there Ron, hopefully that Liquid Blue stuff is worth the wait. Fayte: Thanks, I'm excited to have it and I'm trying to figure out what to use it on. I'm torn on what to try and cast first. I agree with you Fayte. I cannot count how many times I "tried" to clean my desk but it just comes right back the way it was haha.